As airport operator, Brussels Airport Company is constantly improving its infrastructure so as to be able to offer its passengers and partners the best possible service. 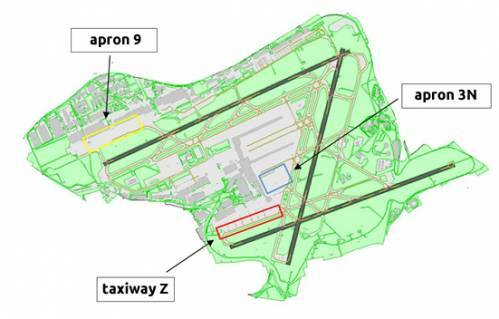 In 2019 we have planned several airfield works: the renovation of apron 3N (zone marked in blue), of apron 9 (yellow) and of taxiway Z (red). The works will have no impact on the application of the preferential runway system ( PRS ). Both apron 3N with taxiway INN9 and apron 9 with taxiway N2 will be thoroughly renovated. These works started last year and are now continued. The concrete pavement will be replaced by a new concrete pavement (aprons) or asphalt pavement (taxiways). On apron 9 400Hz power outlets will be installed so aircraft no longer need to use their own ground power units. Every stand will also be equipped with a Docking Guidance System so aircraft can park without the help of a marshaller. Works on apron 3 are scheduled to be completed by the end of October 2019, whereas the works on apron 9 and taxiway N2 should be completed by September 2020. All works are carried out in stages to limit the operational impact as much as possible. The two upper asphalt layers of taxiway Z (behind aprons 40 and 4, near the Brussels Airlines and TUI fly hangars) will be demolished and replaced. We are talking about a surface area of 50,000m². New sewers will be installed over a length of 710 meters. Moreover, the taxiway lights will be replaced with LED lamps. These works will take place from 1 April to 19 April 2019 from 6 am to 10 pm, 7/7. The works will have no impact on the application of the preferential runway system . However, it is possible that certain aircraft will not take off or land on runway 07R/25L if they need the whole length of the runway . In that case they will take off or land on runway 07L/25R, as prescribed by the preferential runway system . The current runway use is available on this website. At 60, Brussels Airport turned in an excellent performance in 2018 with 25.7 million passengers and 732,000 tonnes of cargo. skeyes and Brussels Airport have developed a new version of the BATC.be information website: as of now, visitors will find a wide range of additional functionalities as well as useful information about runway use, weather observations and forecasts, radar tracks, noise measurements and many statistics.